The Castle Hotel is a wood panelled pub that wears it’s spillages well. It feels both at home in the trendy Northern Quarter, down the road from McClure’s Barbers, and also somehow at arms length. It’s home to a lot of literature and music events but also holds on to it’s local pub feel. I was chatting with a poet the other day that remembers when you would knock on the door and a little shutter would open so the doorkeeper could eyeball you before coming in. Now, though, The Castle is much more welcoming, but daylight still rarely bothers popping in through it’s frosted front windows. This is a pub in permanent shadow with a certain musk that is evidence of clumsy drinkers. Those clumsy drinkers are often performers and audiences. There so many super nights and events that happen at The Castle. There’s us, obviously! And also Bad Language, The Other Room and plenty of gigs. Each of these nights has a slightly different feel, but the thing that connects them all is that they are all open, friendly happenings that take place in the back room of a pub. That ‘back-room-of-a-pub-ness’ is important. It gives each of these nights a cozy, community feel. It means that nothing that happens there can ever feel too pretentious because, underneath everything, it is happening in the pub. It means that when something happens that is so profound that transcends the pub-ness, it is even more powerful. It also helps that comedy sit up well, performing to a room of slightly tipsy folk (that isn’t to undermine the talents of the comedians that perform at First Draft!). 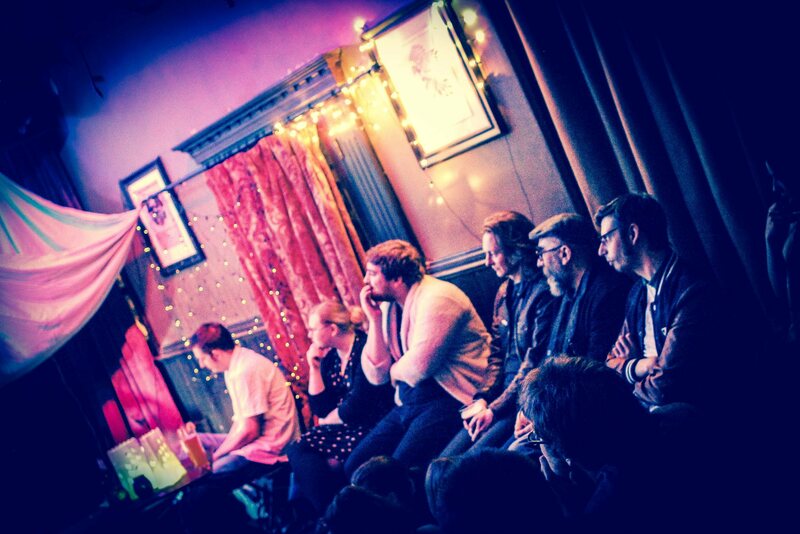 Yes, there are nights when we have audience sitting on the stage and sometimes getting pretty chummy when they’re crammed in at the back, but all this adds to the atmosphere. There’s something important in the fact that First Draft happens in a space that is cosy and inviting especially when we’re happening in a part of Manchester that is a cliche of trendy. As a night that encourages people to try new things and to experiment, that friendly atmosphere is essential. Sitting beyond the terrazzo-ed cafes on Oldham Road, The Castle is on the fringes of NQ but very much central to the First Draft feel. Our next event at our beloved Castle Hotel will be First Draft: Crush on Monday 17 October! Find out more and sign up to perform! Keep your eyes peeled for more info on our extra special Halloween event, which will be on 31 October, and will see us venturing further afield to the beautiful Chetham’s Library!